Patterns of Nature, Brought Indoors! DIY Ideas - Genue Inc.Genue Inc.
We’re in the throes of an intense summer heatwave this August, so it’s hard to believe that autumn is right around the corner. But while our days are getting shorter and shorter, let’s take a minute to enjoy the great outdoors—and make some DIY projects that reflect our love for patterns of nature! Read on to discover three fun craft projects to inspire to add a touch of the natural world to your home décor. 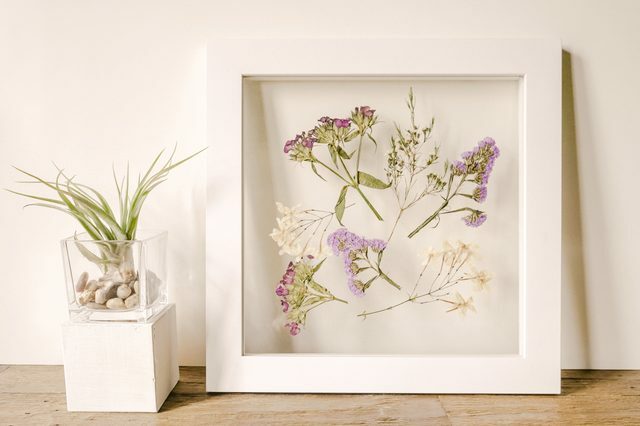 This darling but minimalist frame of pressed flowers by Maya Marin of Hunker.com is an elegant way to bring the color of nature indoors! The process is relatively simple—acquire some small fresh flowers and bouquet fillers (they can be either store-bought or gathered from outside–an excellent opportunity to reuse and repurpose!) and cut them into small sprigs, leaving about 2 to 5 inches of the stem. Find a heavy book, open it to a random page, and then lay a paper towel down, arranging the flowers on it so that there’s some space between each one. Shut the flowers in the book and leave them for about a week, to allow them to fully dry out. Once they’re dry, pull them out and arrange them how you like in a floating frame. Using a very small amount of glue (Maya suggests these adhesive glue drops) attach the flowers to the back pane of the frame, hiding the glue dots under the wider parts of the stems. Once you’re satisfied with your design, place the glass of the frame on top, flip the flowers face down into the frame (see the photos on Maya’s post to get a better idea). The last step is to finish assembling the frame, and enjoy! These adorable resin coasters by Running with Sisters have us dreaming of the beach! What you need for this project are some jar lids that are about 3 ½” in diameter, seashells of varying sizes, pearl beads, spray paint, clear silicone adhesive, a resin and hardener kit, some straight-sided cups to mix the resin in, 2 paint stirring sticks, some protective gear like gloves and goggles, and a toothpick. To begin, take your jar lids and spray paint them in a color of your choice. Next, take your largest seashells and glue them to the bottom of each lid, making sure that the height of the shell doesn’t pass the edges of the lid! Then sprinkle in your smaller shells and beads in each lid–you can even add glitter too! Then it’s time to don your goggles and gloves and mix the resin. Running with Sisters has a fantastic video tutorial to help you with the process! 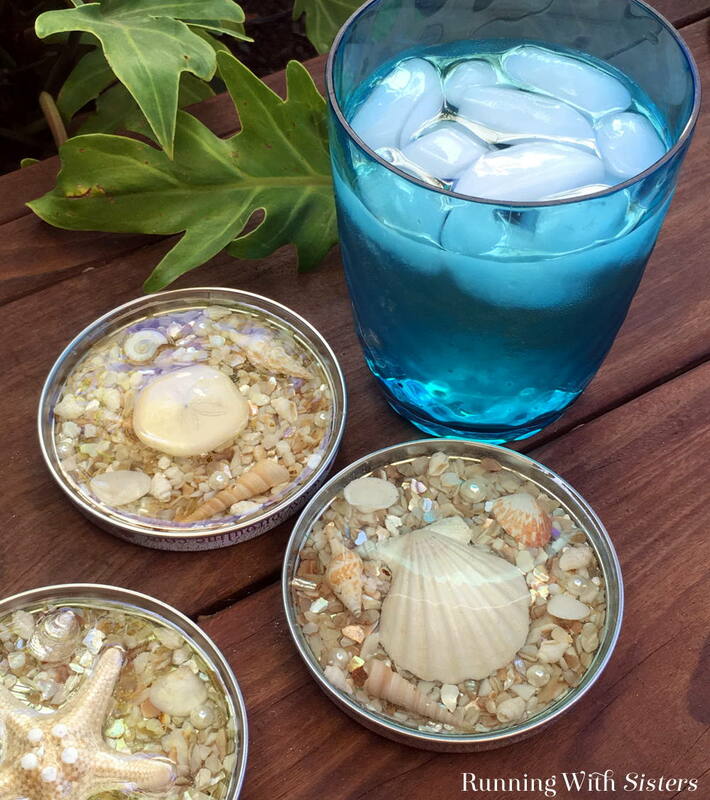 Once you’ve properly mixed the resin and hardener together, drizzle the liquid over the seashells in each lid, filling the lid to the brim completely. Once five to fifteen minutes have passed, you’ll probably notice some bubbles forming in the resin…but not to fear! Use your toothpick to pop them before the resin fully dries. Leave the coasters to dry for 48 hours, and then enjoy your new beach-chic décor! 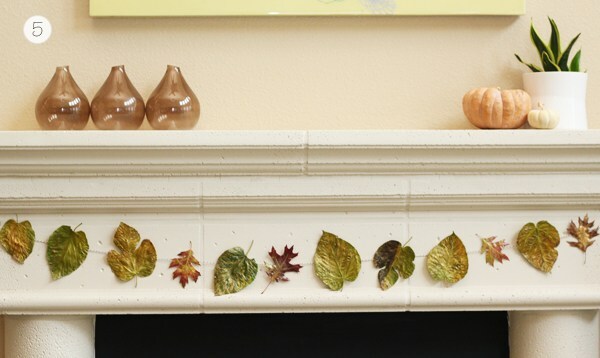 This dried leaf garland by Warm Hot Chocolate is a great project for those young and old! Go outside and collect some leaves that appeal to you. Then, coat each leaf with a layer of Modge Podge glue, and press them inside a heavy book overnight. The next day, use metallic paint to give your leaves a golden sheen. Once the paint has dried, arrange the leaves on a piece of twine, and tape each one to the twine. It’s super easy, and a perfect way to call in the changing seasons! Which project is your favorite? Let us know which one you’d like to try in a comment!